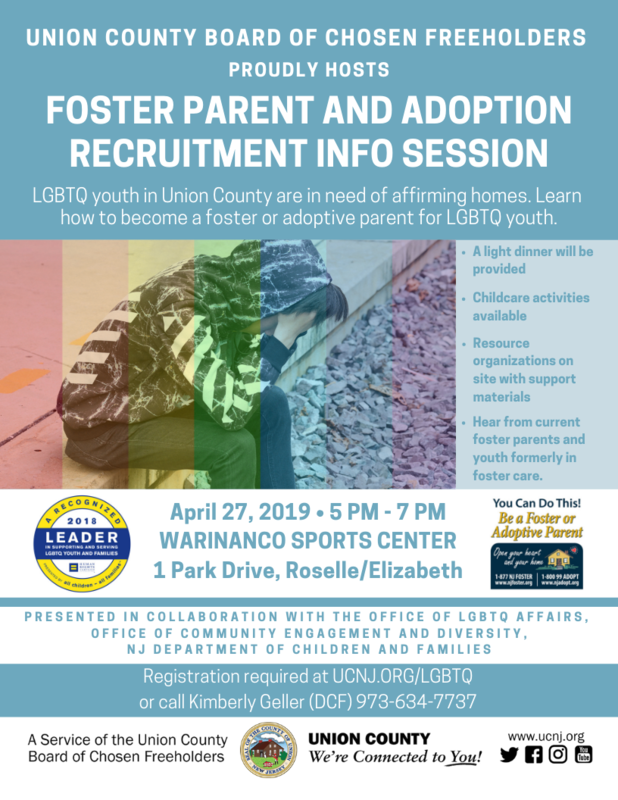 Union County, NJ – The Union County Board of Chosen Freeholders is proud to host a Foster Parent and Adoption Recruitment Information Session on Saturday, April 27, 2019 at 5:00 p.m. the at Warinanco Sports Center at Warinanco Park, 1 Park Drive in Roselle, organized by the Union County Office of LGBTQ Affairs and the Office of Community Engagement and Diversity, in collaboration with the NJ Department of Children and Families. LGBTQ youth are in need of affirming homes. Research has shown that LGBTQ youth are over-represented in foster care. LGBTQ youth enter the foster care system for many of the same reasons as non-LGBTQ youth in care, such as abuse, neglect, and parental substance abuse. Many LGBTQ youth have the added layer of trauma that comes with being rejected or mistreated because of their sexual orientation, gender identity or gender expression. Being a foster parent is a big responsibility that brings with it great rewards. The requirements for becoming a foster parent are not complicated. Join us for this information session presented by the NJ Department of Children and Families and learn how you can provide an affirming home for LGBTQ youth in foster care in our community. All adults who can offer a safe, stable and supportive home – regardless of culture, religion, race, ethnicity, gender, sexual orientation, gender identity or gender expression, affectional orientation, or marital/civil union or domestic partnership status – are invited to attend this information session to learn more. During this two-hour information session you’ll hear from current foster parents and youth formerly in foster care. Youth resource organizations will be present with additional support materials. Child care activities are available during the session. Light refreshments will be provided. Registration is required to attend at ucnj.org/lgbtq or by calling Kimberly Geller (DCF) at 973-634-7737. Union County’s Office of LGBTQ Affairs, under the Department of Economic Development, was established by the Freeholder Board in 2018 and is the first and only county government office of its kind in the State of New Jersey. The Office of LGBTQ Affairs provides a platform for leadership and collaboration to support equality, and serves as a catalyst for advocacy, awareness and action on current and emerging issues that impact the lives of lesbian, gay, bisexual, transgender, and queer individuals. For more information about the Office of LGBTQ Affairss, contact Danni Newbury, Coordinator, at 908-527-4742 or dnewbury@ucnj.org or visit ucnj.org/LGBTQ.